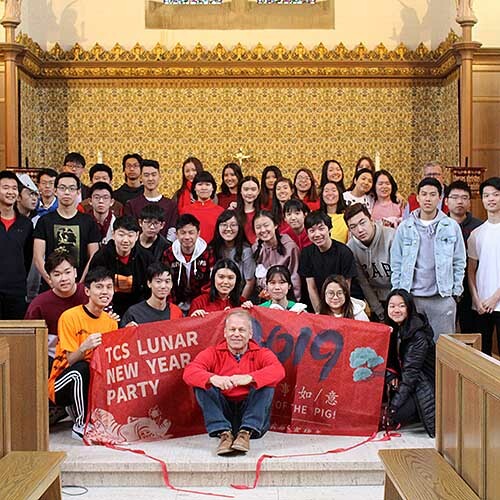 The Trinity College School community celebrated the incoming “year of the pig” with Lunar New Year events hosted by our Chinese families on the eve of the new year, Monday, February 4th. Lunar or Chinese New Year, which this year falls on February 5th, is a holiday dating back more than 4,000 years. It marks the start of the lunar calendar year and the beginning of Spring Festival. The year of the pig in the Chinese zodiac is associated with wealth and good fortune. This year, students of Chinese descent at TCS wanted to do something special to mark this occasion. With the help of a dedicated group of parents, they created an entire day of events that invited all students and staff to celebrate. This was a non-uniform day, with everyone asked to wear red, a colour that symbolizes good luck in Chinese culture. In morning chapel service, Junior and Senior School students were treated to a musical performance, as well as a presentation and skit that explained some of the Chinese New Year customs and beliefs. Students were thrilled to find red envelopes containing chocolates under their seats in the chapel! At morning break, a video was shown in Cirne Commons that highlighted New Year’s events in China. And during afternoon flex block, the commons came alive with celebrations, including stations set up so that students and staff could experience food, calligraphy and crafts. A special presentation was made to Headmaster Stuart Grainger on behalf of the Chinese families at TCS. The community also got to taste some incredible Chinese cuisine at both lunch and dinner time in Osler Hall. Chinese families worked with Chef Patrick McClean and his culinary services team to provide amazing dishes, from dim sum and noodles at lunch to BBQ pork belly and Moo Goo Gai Pan at dinner. Osler Hall, and areas around the School, had been decorated by the families with paper lanterns and red cards bearing symbols associated with the holiday. The day wrapped up with Senior School students being allowed to leave study early and head to Cirne Commons to watch a beautiful display of fireworks on the west lawn. This was truly a day to remember for our school community, and a wonderful opportunity for all of our students to learn about and experience first-hand various aspects of Chinese culture. Thank you to our Chinese students and to their parents for sharing their celebration with us!